I love Sarah Naughton. We have done a few interviews together and now, I love her co-writer/star Jake Weinstein just as much! We had so much fun talking about their new federally approved musical cabaret JAVANKA: Back in New York. Press notes state, Jared Kushner (Weinstein) and Ivanka Trump (Naughton) are finally back in the city where they belong to share their story through their favorite medium of all, Broadway showtunes! Featuring songs from Company, Fiddler on the Roof, A Chorus Line, and even some original tunes, there’s nothing anonymous about this tell-all! And who knows who else from the White House might pop by! Don’t wait until Mueller releases his report, come see Jared and Ivanka sing for yourself! JAVANKA: Back in New York comes to Feinstein’s/54 Below (254 West 54th Street) on Friday, February 15 at 9:30pm. Click here for tickets! For more on Sarah visit https://www.sarah-naughton.com and follow her on Facebook, Twitter, and Instagram! For more on Jake visit https://www.jakeweinstein.com and follow him on Facebook, Twitter, and Instagram! 1. This February you are returning to Feinstein's/54 Below with your new show Javanka: Back In New York. When did you decide to write this show and how long did it take you to create it after you had the idea? Jake Weinstein: We had the idea last fall. And we're still creating it! The news moves so fast these days that we're constantly updating it! We also had so many ideas for songs that we had to cut a lot of songs that we wanted to include in the show. Sarah Naughton: As soon as we had the idea we got really psyched and then everything flowed so easily, hence us having to cut so many songs. We also felt like Jared and Ivanka haven't been impersonated as much as Trump or Melania. So it felt fresh. 2. What should audiences know before coming to see the show? Jake Weinstein: I guess they should know that we might be having some fun at the expense of the first family...Other than that, they can expect to hear showtunes and jokes! Sarah Naughton: Yup the audience should come in ready for some absurdity and some surprises! Jake and I wanted to create a show that was satirical and entertaining. 3. Sarah, you are playing Ivanka Trump & Jake, you are playing Jared Kushner. What do you each relate to most, if anything, about them? Jake Weinstein: Being Jewish? Not sure what else I relate to...Being ambitious I guess. Think it stops there. Sarah Naughton: I feel pretty dissimilar to Ivanka. She's so polished and put together whereas I'm a lot more all over the place. But she's loyal, doggedly so, she won't say anything against her father publicly. And I'm very loyal to my friends and family too. 4. What is one characteristic of theirs you are glad you yourself do not possess? Jake Weinstein: I am glad that I did not sell out my ethical standards! Sarah Naughton: Ivanka doesn't seem to have a sense of humor about herself. So that. I'm glad I can laugh at myself. 5. Since this story is about how happy Ivanka & Jared are happy to be back in NYC, what is your favorite thing to do in NYC? Jake Weinstein: I love going to see theatre (obviously). I also love all of the public spaces, especially the parks! I love Riverside Park when the weather is nice. Sarah Naughton: I love spending time in my neighborhood, Cobble Hill, BK. I moved not long ago, so I feel like every day I find a new cute shop or restaurant. Colonie is a new favorite restaurant of mine in the area. 6. What is your favorite thing to do in Washington D.C.? Jake Weinstein: Go to the museums! (When the government is open) I love all of the Smithsonians. Sarah Naughton: I don't know D.C. well, so what Jake said! 7. Press notes state, "There is nothing anonymous about this tell-all." What is one thing that would be revealed in your own tell-all book about your lives? Jake Weinstein: This is a tough one! I think I have to keep that under wraps! Sarah Naughton: Jake is a little more secretive than me. The last show we did together WAS a tell all about my life narrating romance novels in my closet! So all of that would definitely be in there. And is probably the most salacious thing about my life. But I did give celebrity gossip tours of the city for a while, and that's maybe the thing I'm the most embarrassed about doing. 8. If Jared and Ivanka were to perform a cabaret show together, of the songs you are singing, which one do you think they would choose? Jake Weinstein: I don't want to give anything away, but there is some stuff from Fiddler I think they might like! Sarah Naughton: They seem like Phantom of the Opera people to me, and without giving too much away, there are a few Phantom selections in our show that I think they'd like. 9. What song you would want to duet on with Jared and Ivanka? Sarah Naughton: I'd love to have them sing our opening number with us! (No spoilers) but it would be great to have a few extra voices on that one, and I'd love to hear them sing the lyrics we wrote for it. 10. Playing with the title of your previous show, if you were Trapped in The Closet with Jared and Ivanka, what outfits would you pick out for them (amongst the clothes you have)? Jake Weinstein: Definitely sequined dress shirt from a performance I did a couple years ago. I think he'd look fabulous! Sarah Naughton: Jared in sequins yes please! I'd love to dress her down. Get her in some nice sweats. Or a groutfit (grey outfit) would be a nice change of pace for Ivanka. Jake Weinstein is performer, composer, and creator in New York City. Favorite performing credits include “Peter” in Peter and the Wolf (BAM), “George Gershwin” in Gershwin: Got Rhythm (Kaye Playhouse), “Mark” in A Chorus Line (National Tour), “Beats” in Chasing the Song (La Jolla Playhouse), and “Conductor” in AcousticaElectronica (House of Yes). 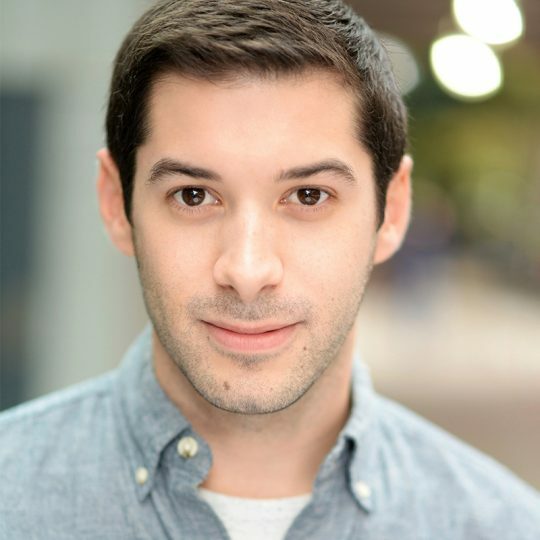 Jake served as Co-Director/Choreographer, Composer and Performer in the short film Ode to the Singing Butler, for which his score won 1st Place at the Golden Key Composition Competition in Vienna, Austria. The film has appeared in festivals around the country and can now be viewed online. As a songwriter, Jake has performed at Rockwood Music Hall, Feinstein’s/54 Below and other venues around the city. Jake trained at the New England Conservatory of Music and received his B.A. from NYU Gallatin School of Individualized Study concentrating in collaborative musical theatre performance, music composition, and producing. Jake is a proud member of Actors’ Equity. Check out his website www.jakeweinstein.com and instagram @jakeweinstein1. Sarah Naughton is a singer, actress, and Audie-nominated audiobook narrator living in New York. Some favorite credits include: New York Theater: REAL (The Tank), Death Comes for the War Poets (The Sheen Center) Romeo and Juliet (Lincoln Center - Clark Studio Theater), Diamond Alice (Roundabout Underground), and Summer and Smoke (Access Theatre). Regional Theater: Mame (Human Race Theater Co), AcousticaElectronica (A.R.T. Oberon), and Meet Me In St. Louis (Mt. Gretna Playhouse). Sarah has narrated over 100 audiobooks which are all available on audible.com. Additionally, Sarah is a comedy veteran and has performed stand-up on ABC’s The View as well as at major NYC venues such as New York Comedy Club, Stand Up NY, and The PIT. Sarah is also a member an immersive dance theater company called toUch performance art and she works as an assistant teaching artist for CO/LAB theater group, a non-profit organization that has been providing individuals with developmental disabilities a creative and social outlet through theater arts since 2011. Sarah holds a BFA from NYU Tisch and is a proud member of Actors' Equity. Check out her website www.sarah-naughton.com and instagram @illuminaughton.